But there’s more to life than staying where you are. Chesney, who rewrote the playbook of post-modern Country with No Shoes, No Shirt, No Problems and the CMA Album of the Year When The Sun Goes Down, realizes that. He’s evolved. His audience has evolved. Loss. Love. Life. Reality. Pressure. Obligation. It all adds up, sometimes obscuring the beliefs that keep us all moving forward. “This record humanizes my relationship with the fans,” he explains. “It’s always been a two-way relationship. They need me and inspire me, push me. But this time, I knew I needed to inspire them! I needed to find songs that shoved me into my life in new ways, to inspire the guys playing to create something more, because if we couldn’t inspire ourselves, how could we expect anyone else to care? How can we take people who have busy lives and say, ‘This matters… Your life matters…’ when we don’t sound that way? “These songs almost mandated how hard we came at them. Even the quiet ones demanded real presence. The way Chad Cromwell hits the snare, there’s nowhere to hide; he’ll topple all your walls. The music and players led me to this place. That’s what you need. If you listen to the energy, the raw, honest energy, especially on the tempo tracks, you can hear the shift, actually feel the passion and the energy. It’s palpable – and I like that. It’s what’s needed to really drive it. The Big Revival is eleven songs that weigh the state of the human condition between the coasts without bogging down or losing hope. Whether it’s the stark philosophical Appalachia of “Don’t It,” featuring GRAMMY winners Alison Krauss and Dan Tyminski, the rousing invitation to live every last moment of “Til It’s Gone,” the picture postcards of a free spirit in “Wild Child,” with a yearning return from Grace Potter, or the percolating shower of words “American Kids,” the project’s lead track, this is an album about engaging, seeking something more, feeling more alive – wherever you may be in your life – than you ever have. When he found “American Kids,” the lead single from The Big Revival, he knew he had something unlike anything he’d ever cut before. Co-producing with longtime collaborator Buddy Cannon, The Big Revival marks Chesney’s 15th studio album. With the emphasis on great songs, pushing the boundaries without betraying who he is, The Big Revival takes Chesney’s music and lays it wide open. With its first No. 1 in “American Kids,” it looks like the songwriter/entertainer’s next wave is going to break ground and make his fans really happy. To receive your copy of the Publisher Issue subscribe now. 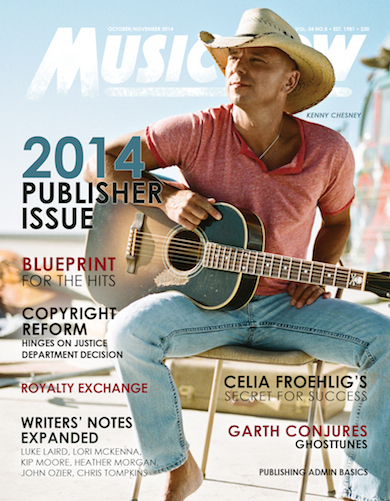 For information on purchasing individual copies of MusicRow magazine, click here.